▲0% APR Purchase Financing is available on select new 2018 Mazda models. Terms vary by model. Excluded on 2018 MX-5/MX-5 RF and all 2019 models. Terms vary by model. Based on a representative agreement using an offered pricing of $17,695 for the new 2018 Mazda3 GX (D4XK68AA00) with a financed amount of $17,791.56, the cost of borrowing for a 72-month term is $0, monthly payment is $245.76, total finance obligation is $17,791.56. Offer includes freight and P.D.E. of $1,695 and $100 air conditioning charge (where applicable). Offer excludes PST/GST and the specific duty on new tires. 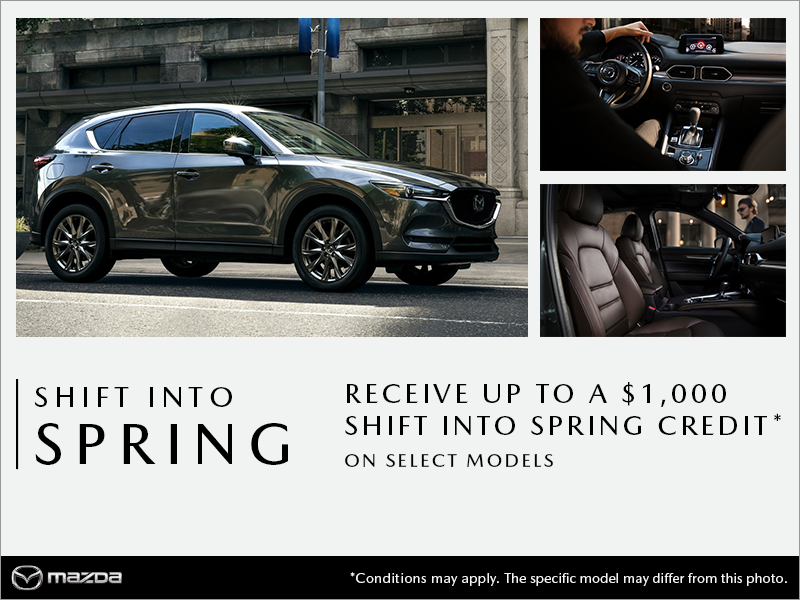 ▼Shift Into Spring Credit offer (value up to $1,000) is available to qualifying retail customers who cash purchase/finance/lease a select new, in-stock 2018 and 2019 Mazda model from an authorized Mazda dealer in Quebec between April 2 – 30, 2019. Amounts vary by model: $300 on all 2018 Mazda3/Mazda3 Sport, on all 2019 Mazda6, on all 2019 CX-3 and on all 2018 & 2019 CX-5 models. $475 on 2019 MX-5 ST GS models. Maximum $1,000 on all 2018 MX-5 ST/MX-5 RF, on 2019 MX-5 ST GS-P & GT, on all 2019 MX-5 RF, on all 2018 Mazda6, on all 2018 & 2019 CX-9 models. Shift Into Spring Credit applied before taxes. Some conditions apply. NOTE: Shift Into Spring Credit offer not available on 2019 Mazda3 models. See dealer for complete details. †Bi-weekly lease offer for a new 2019 Mazda CX-3 GX (HVXK69AA00) / 2019 CX-5 GX (NVXXL89AA00) /2019 Mazda CX-9 GS (QVSM89AA00) / 2018 Mazda6 GS 2018 (G4SN88AA00) base models, priced at $23,040/$31,845/$38,695/$28,895, with 130/130/130/130 bi-weekly payments of $111/$167$/$218/$175, for 60 months, with $2,195/ $2,595/ $0 / $0 down. 20,000 km/year kilometre allowance; charge of $0.08/$0.08/$0.12/$0.12/km for excess kilometres.